This makes low alcohol beers most vulnerable to degradation and strong beers more resistant. 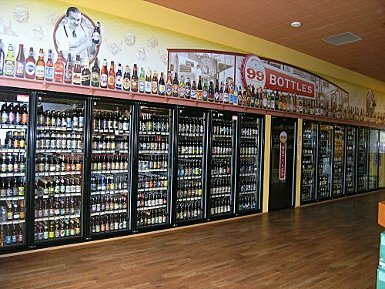 As such, after hop-centric beer styles, refrigerator space should be allocated to lower alcohol, mildly flavored beers. Still, all normal beer should be refrigerated. Once a beer hits about eight percent alcohol it is widely considered to be strong ale and is a possible candidate to be kept at cellar temperatures. All should note that cellar temperature does not mean room temperature. For the consumer, the refrigerator is usually the best option for storage. If refrigerator space is an issue, while not ideal, a week or two in the pantry is not going to ruin your beer. The only types of beer where temperature is immediately detrimental are the hoppy styles previously discussed. Normal beer can be stored at will, on the shelf or in the fridge with little issue, just as long as it is drank within a reasonable amount of time. For the record, change in temperature (like from refrigeration to ambient temperature) does not harm beer and happens on many occasions during the distribution process. This is a myth in popular beer culture, and some have even suggested this skunks beer, which is impossible, as skunked beer occurs exclusively when UV light interacts with hop compounds. This entry was posted in Age, Features, Freshness and tagged age, cellaring, freshness, storage. Bookmark the permalink.